This entry was posted on November 16, 2014 at 2:53 am and is filed under Biography, Drama, Sports with tags 2014. You can follow any responses to this entry through the RSS 2.0 feed. You can leave a response, or trackback from your own site. Well I’m sure curious. Nice post–I look forward to watching it. Look for it when it goes into wide release. It’s so good. Great review. Can’t wait to see these performances! I predict at least one of them will get a nomination. Perhaps more. I really, really, really hope this expands to a wider release. A MUCH wider release. Box Office Mojo is trying to tell me that it’s only playing in 6 U.S. theaters, and that’s a pretty huge level of unacceptable in my book. It seems like a possibility, since Sony Pictures Classics’ last film for Bennett Miller (Capote, of course) started in 12 theaters and expanded eventually to somewhere around 1,500. The DuPont family is a really prestigious name up here in Pennsylvania/Delaware area, so I feel like I’m obligated to see this, more than I’m obligated to see any other movie this year. Plus it won Best Director at the Festival de Film de Cannes (and I do love Bennett Miller’s last two films), Steve Carell’s been praised ever since this entered competition at Cannes, and your review reaffirms all of that. Rest assured. It expands wide on Nov 28th. I was quite impressed with Channing Tatum. He was cast against type here. Not at all the confident ladies man that he usually plays. You know how I first claimed Interstellar to be my top priority of the year? That all changed when this came into view some couple months ago (for me, I’m sure this has been a known property for the more attentive of us! ha) and I was sure this might be among the elites of the year. This review does nothing to change that expectation. I know my praise is high but I don’t think I’ve over-sold it. 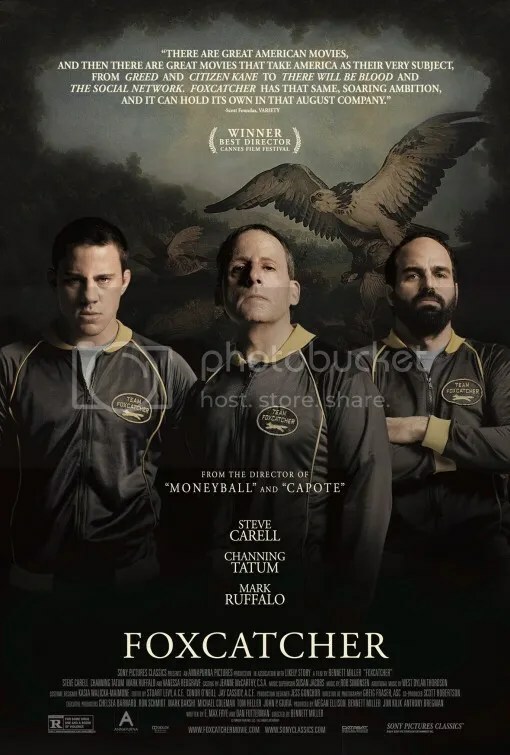 Foxcatcher really is pretty special, albeit very dark. Pretty dark movie. So eery and mysterious. 3 performances were outstanding. Carel and Tatum were very different and so good. Ruffalo was surprisingly good too. I forgot he was in the movie, but glad he was. 4 1/2 stars. It stays with you. This was disturbing. So excited to see this – lovely review! I know she has a small role, but how was Sienna Miller? She plays the wife of Mark Ruffalo’s character. Her part is so small you barely even see her. Wait for American Sniper. She has much more of a presence in that. I enjoyed reading your take even though I was utterly disappointed in the movie. I did think Ruffalo and especially Tatum were very good, but Carell just didn’t do it for me. Hmmm, that’s surprising to me. Ruffalo and Tatum were my faves too, but Steve Carell was quite good. There’s still a lot of buzz surrounding him for a Best Actor nomination although his chances are declining.